You are here: Home / nutrition / Ever Used this MEDICINAL Plant Before? While the image below may not look very appetizing, Licorice Root is probably the most overlooked medicinal plant on the planet! This is one of the most extensively researched medicinal plants in science. Licorice is an adaptogenic herb, which means it helps your body deal with stress. It turns out, licorice helps your body to regulate the stress hormone cortisol, which takes a load off of your adrenal glands. Anti-Depression (by encouraging the adrenal glands). Since our adrenal glands control stress hormones, cortisol remains balanced. Without this stress control we feel moody, dressed, anxious, and nervous. Licorice root has the amino acid, Asparagine, that is needed to preserve balance in the body’s nervous system. This is a phyto-estrogenic plant. Meaning it helps hormones get back into balance. So while going through menopause it helps with mood swings, hot flashes and exhaustion. Try Licorice root tea 3 days before menstruation to alleviate symptoms of bloating, cramps and moodiness. The licorice root’s flavonoids help with inflammation of the digestive system. 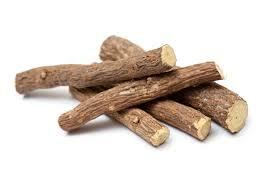 Also, licorice root may quiet and soothe the digestive system, which in turn can help to promote a healthy bowel. Have some licorice root tea 2 to 3 times a day. Since it’s an anti-inflammatory and antispasmodic it helps with PMS symptoms. – Relieves constipation. It’s has a natural laxative effect by promoting peristalsis. Side effects: Because of its strong estrogenic effect, pregnant women need to avoid this. Also if you are allergic to peas, beans or legumes avoid this. *While licorice root has many beneficial properties, be careful not to overdo it (both by taking too high of a dose or by taking it for too long). The active ingredient, glycyrrhiza, if taken in excess, can lead to pseudo-aldosteronism, which makes you overly sensitive to a hormone aldosterone in your adrenal cortex. So give Licorice Root a try next time you are experiencing any of the above symptoms. Can You Name the BEST Fat Burning Fruit?